The Cumberland & Dumfriesshire Farmers Mart P.L.C. had forward 1,047 store hoggs & 406 ewes with lambs at their weekly sale at Longtown on Tuesday 13th April 2010. 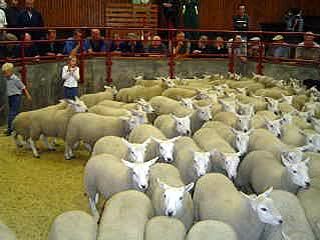 Store hoggs were a good show and easily sold to the usual buyers. The sale was topped at £94.50 for Texels from Linton House, others £87.50 Nether Albie; Suffolk £87.50, £82.20 Linton House; Greyface £78.50 Glenkiln, £69.20 Linton House, £66.80 Black House; Charollais £72.80 Jury Park; Bleu d’Maine £69.50 Linton House; North Country Cheviot £66.20 Linton House; Hill Cheviot £63.80 Linton House, £62.20 Unthank; Swaledale £63.50 First Watling Bungalow; £61.50 Milescott, £57.20 Maxton; Shetland £57.80 Cottage Farm; Beltex £56.80 Jury Park. Feeding ewes sold to £128 for Texels from Linton House, others £123 Glenkiln; Suffolk £123 Glenkiln; Greyface £88 Linton House; Blackface £79.50 Linton House. A larger show of ewes with lambs at foot met a solid trade and numbers were short of buyers requirements, selling to a top of £66 for Suffolk ewes with twins from Linton House; Texel ewes with twins £57 How Farm and Pennine View, £53 Maxton; Texel ewes with singles £59 Maxton; Greyface ewes with twins £61.50 How Farm, £59 Linton House; Greyface ewes with singles £62.50 Pennine View, £58 Brookfield; North Country Cheviot ewes with twins £42.50, £40.50 East Middles; Cheviot Mule ewes with twins £57.50 Pennine View.